Traditional balsamic vinegar is the grand daddy of balsamic vinegars. To this day it is only made in Reggio Emilia and Modena, Italy, using traditional methods, and production is overseen from beginning to end by a special certification agency. Traditional balsamic is not a cooking ingredient — heating it will kill its distinctive bouquet — and it would be wasted as an ingredient in a salad dressing. Instead, use it where it can shine. Try putting a few drops on fresh berries, Parmigiano-Reggiano cheese, or creamy desserts like panna cotta, zabaglione, or vanilla ice cream. 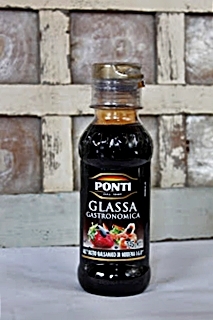 Traditional balsamic can be used at the end of cooking. It's excellent drizzled over traditional veal scaloppine, a rich risotto, or the Italian stew bollito misto. It's also great over grilled meats and seafood. Add about a teaspoon per person just before serving to get the best of its flavor. In Italy really good balsamic is also drunk as a palette cleanser, aperitif or digestif, especially on special occasions such as weddings. The name "balsamic" connotes the vinegar's original use as a tonic, or "balm." Grapes. Where all traditional balsamic vinegar begins. Whole pressed grapes complete with juice, skin, seeds and stems is a must to produce this, usually Lambrusco or Trebbiano varieties. The grapes are cooked over a direct flame until concentrated by roughly half, then left to ferment naturally for up to three weeks, and then matured and further concentrated for a minimum of 12 years in a "batteria," or five or more successively smaller aging barrels. These barrels are made of different types of wood such as oak, chestnut, cherry, juniper, and mulberry, so that the vinegar can take on the complex flavors of the casks. Once a year the vinegar is bottled from the smallest cask in the sequence. Each cask is then topped up with vinegar from the next cask up, with the largest cask getting filled with the new yield. None of the casks are ever completely drained. This ageing process is similar to the solera process used for fine sherries, ports, sweet wines, and Spanish brandies. The vinegar gets thicker and more concentrated as it ages because of evaporation that occurs through the walls of the barrels—the vinegar the smallest barrel will be much thicker and more syrupy than the liquid in the successively larger barrels. Because of the multi-barrel process, it takes complex math to gauge the average age of the bottled product, so instead a tasting commission of five expert judges convenes to taste the vinegars and determine an appropriate grade, and no age is printed on the label. In Reggio Emilia, traditional balsamics are graded affinato (fine), with a red cap, which roughly corresponds to a 12-year vintage; vecchio (old), with a silver cap, which roughly corresponds to a 15-20 year vintage; or extra vecchio (extra old), with a gold cap, which roughly corresponds to a 20-25 year vintage. In Modena there's just affinato, with a white cap, or extra vecchio, with a gold cap. Color and Texture: Traditional balsamic vinegar is glossy, viscous, and dark brown, though it captures light beautifully. It moves like syrup, and has a velvety texture on the tongue. Flavor: A rich, complex sweetness that explodes in the mouth with notes of fig, molasses, cherry, chocolate, or prune. Traditional balsamic should pick up the flavors of the wood it matured in, and may have a slight smokiness. Traditional balsamic offers a mellow tartness rather than a strong acidity. 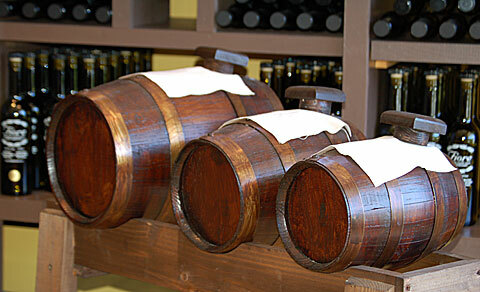 Identification: Traditional balsamic vinegar is always labelled Aceto Balsamico Tradizionale and carries a D.O.P. ("Denominazione di Origine Protetta") stamp — a European Union certification that guarantees an ingredient's quality, production, and place of origin. The only ingredient is grape must. Traditional balsamic contains naturally occurring sulphites; none should be added. Traditional balsamic is sold in wax-sealed bottles with unique identifying numbers. 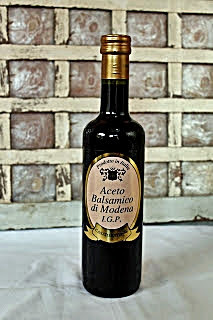 Traditional balsamic from Modena is only sold in a bulb-shaped 100ml bottle. If it's from Reggio Emilia it's only sold in a 100ml bottle shaped like an inverted tulip. If it's from anywhere else, it's not traditional balsamic vinegar. Storage: Traditional balsamic vinegar will keep indefinitely, but store in a cool dark place to best preserve the complexity of its flavors, and keep away from other pungent ingredients. Balsamic vinegar will not continue to mature in the bottle. 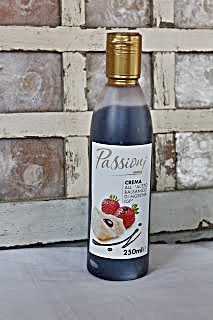 Gastronomy by Joy is now selling different kinds and brands of Traditional Balsamic Vinegars from Italy. Do visit this link for the list and prices. You can also click on the page found at the upper left side and look for the page AUTHENTIC ITALIAN PANTRY ITEMS FOR SALE!